Another crazy week for me as Summer is winding down. My son is turning 3 this week so we had his birthday party over the weekend so I'm getting to this post a little late. I have to say with Summer coming to a close we are getting closer to my favorite season, Fall and with Fall comes Pumpkin flavored goodies. I've already had all 3 different Pumpkin Lattes from Caribou coffe (they just started them on Friday), now if I could sit somewhere quiet and sip them while I read....then that would make for an even better day. So my haul this week is pretty exciting. I'm part of the C.C. Hunter street team so I got my kit yesterday. Hooray!! 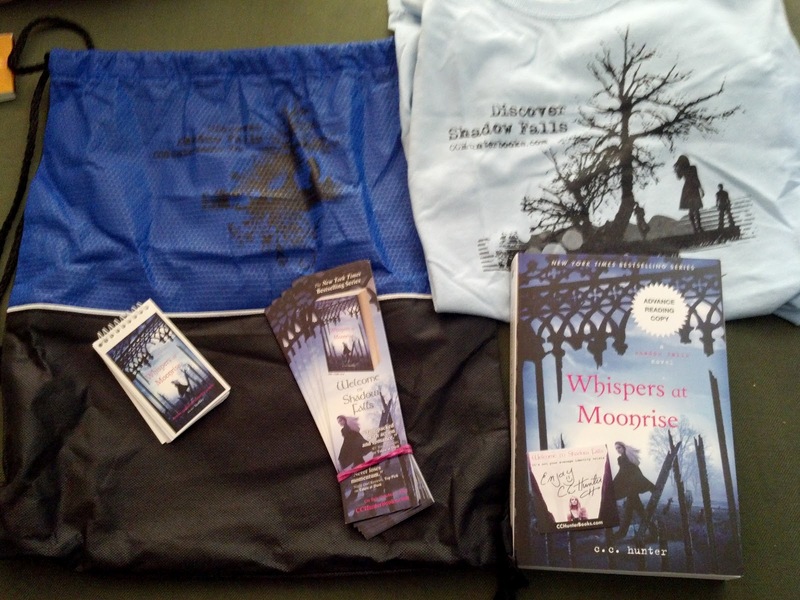 So Thanks to the always wonderful St. Martin's Press who sent me this nifty Shadow Falls bag, t-shirt, notebook, bookmarks, signed book plate and of course ARC of Whispers at Moonrise. I might have given it all a little hug...or a big hug. I'm excited to get the word out about the series. If you haven't made it over to Jennifer L. Armentrout's blog to check out the laptop scene from Obsidian....well you are missing out so do it. Laptop Scene. Alright I'm off to write a bunch of reviews. Thanks for stopping by!! I also can't wait for fall! Reading with a pumpkin latte, ah, heaven! The kit looks fabulous, I'm off to check out the book now. Enjoy the book you got!! And Happy belated birthday! !